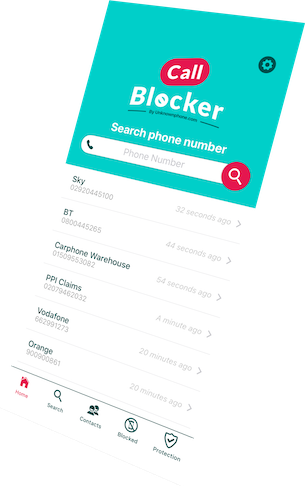 Call Blocker - Block, identify & report unwanted calls. Available in App Store and Play Store. Block, identify and report suspicious phone numbers. The most complete app to avoid phone scams, unwanted calls and extra charges in your bill. Block, identify and report suspicious phone numbers. Unknownphone.com brings you the most complete app to avoid phone scams, unwanted calls and extra charges in your bill. With more than 500.000 telephone numbers registered and identified in our database and a community with millions of users around the world. Every time a dangerous phone number calls you we will identify it for you, so you can decided whether to answer or not. Can't be bothered? No worries, we will block all dangerous phone numbers who call you. Got a call but you are not sure who the owner is? Just search it in our database and see what our community says about it. Biggest community in internet. We have lot of users with similar problem to yours.  After 8 years helping our users to identify who is calling we have built the largest database of spam phone numbers. And we give it to you for free. We got you covered, check those faq if its not there just ask us. Completely free. You can use this app as much as you want! Can I block any phone number? Yes, just write the phone number you want Call Blocker to block and you are all set! You will never get a call from that phone number. How can I update the Call Protection? 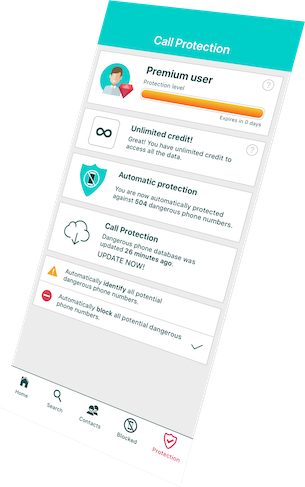 The Call Protection updates automatically every sunday protecting you against the top callers in your country. You can manually update the list of the top callers of your country once per day. How many spam numbers do you have identified? We have the biggest database of spam phone numbers. Our app gets fetchs results and compares dangerous phone with unknownphone.com, the biggest phone spam directory on the internet. Love it. This blocks telemarketers, 800 numbers, and my old boyfriend!!! Not only can you block calls but you can look up numbers - this tells me what's a scam before I answer, then I block their number, and I never get another call from them! Easy to set-up and within 2 minutes of downloading it was up and running with my contacts. It works fine on the free version, but the protection is way better if you go up in credits. But I really love that credits refresh weekly. You can keep going as a free user and if you don't have a lot of people to block free is probably more than enough. This app is awesome!! Every day I'll get calls from unknown numbers, and caller ids named scam likely and it was really annoying because I have to work and I don't want to turn my phone off incase a family emergency, so the spam calls always was a bother especially because it was a different number and location each time, but thanks to my mate who recommended me this app, I now barely get any spam calls!  Any number i find suspicious i just block it. I even blocked my ex number lol! Definitely give this app a shot! This app is a life saver. A while ago someone must have given my phone number by accident when asking for mortgage quotes. I started getting 10 phone calls a day from mortgage companies! And they don't give up! Thanks to this app I blocked all of them! It's functional, easy to use. Love it. 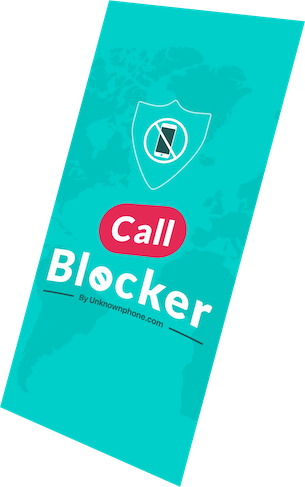 Thanks Callblocker!